Describe how private access works in Desk.com. Set up private access for your support site users. List the different authentication options in Desk.com. Now that your support site looks great and has a library of knowledge base articles, you’re ready to grant your customers private access to their own account. Private access gives them a more personalized support experience. When your customers log in, they can keep track of all the cases they’ve submitted to your team. Sometimes they can also track cases submitted by others in their organization. Best of all, they can submit cases to your support center without having to provide their personal details every time. Desk.com gives you control—by providing different levels of authentication, you can limit what customers can do with this private access. Ready? Let’s set it up! In the Admin console, click Channels. Set Authentication Method to Desk.com (Use Desk.com’s or Social). For nothing—logging in is never required. For interactions only—this requires customers to log in if they want to communicate with you through any available channel. For everything but home page—this requires customers to log in to view any of your topics or articles, or to communicate with you. For everything—this requires customers to log in to do anything on your site, including viewing your home page, searching, viewing a topic/article, or contacting you. And you’re done! You enabled Private Access on your support site. Let’s look at how your customers can set up their accounts. 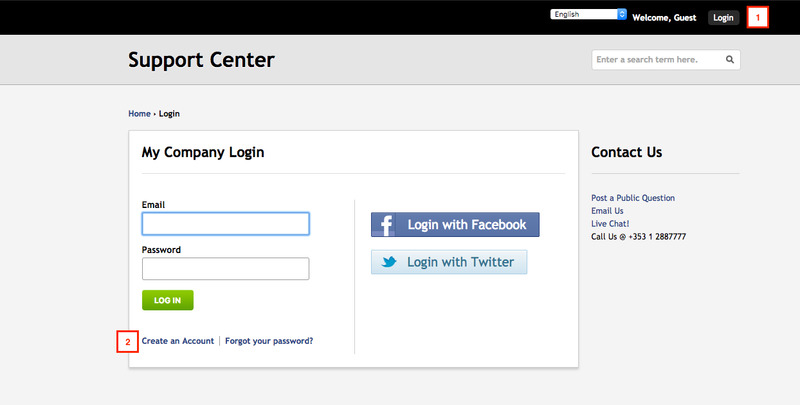 When customers want to create an account on your support center, they click Login (1) and then Create an Account (2) on the login page. Here, you can provide them with up to three options. Create an account for your site with their own email address and password. Log in with Twitter (customers are prompted to verify an email address after they’ve logged in with Twitter). To disable any of these options, simply toggle the switch to Off. Desk.com lets you search for customers who have signed up to your private portal. Click Admin > Channels > Portal Users and type the user’s email address into the search bar. If your company has customers that already have an account on the company website, and you want to let them access your support center using the same credentials, then Multipass is for you. We don’t cover the setup of Multipass in this unit, but you can find a helpful guide in the Resources section. If you use your own domain for your support center instead of the URL provided by Desk.com, you have some special requirements before you can use Private Access. When you set up your domain, you also set up one or more Canonical Name (CNAME) records. You need a secure sockets layer (SSL) certificate for each CNAME record (one for each brand if you use Multibrand). If you want to learn more about installing an SSL certificate for your Desk.com support center, check out the helpful SSL cert guide in the Resources section. Congratulations! Your center is now a full-fledged support hub, where customers can learn about your company’s products and services, create and manage cases, and help themselves. You’ve designed a unique support experience for your customers.